In which we find we are all like candles. 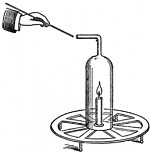 In 1860, near the end of his illustrious career, Faraday presented a series of lectures on the chemistry of a candle at the Royal Institution in London as part of its Christmas Lectures series. The Christmas Lectures began in 1825 and continue today, a British yuletide tradition aimed at the younger members of society but accessible to all. (In 2018, the topic is “Who Am I?”) Faraday’s lectures, titled “The Chemical History of a Candle,” included demonstrations of experiments which in 2016 Bill Hammack, a professor of chemical and biomolecular engineering at the University of Illinois at Urbana-Champaign, and Don DeCoste, of the department of chemistry, re-enacted, in a sense, modifying them for a modern audience and then making them available in modern ways. Their e-book is free; a printed version can be purchased online; videos on YouTube may be watched anytime. … a wish that you may, in your generation, be fit to compare to a candle; that you may, like it, shine as lights to those about you; that, in all your actions, you may justify the beauty of the taper by making your deeds honorable and effectual in the discharge of your duty to humankind. Hammack and DeCoste’s version of the lectures is readable, watchable, and eminently enjoyable, but I wanted to see—to read—Faraday’s original lectures, which were first published in 1861, and I found online what claimed to be transcriptions of them. Mostly, of course, these were ocular whatchamacallits, digital reproductions, some of which were rather unreadable with all the goofy characters that result from the misreading of smudges and stray marks, but, anyway, still, versions of the original lectures by Faraday. One was readable enough, and in it one does find slightly different language from the twenty-first century remake. For instance, in the quote above, rather than “humankind” Faraday says “fellow-men.” I can almost hear Faraday and our modern-day chemists having a brief discussion about this change in language as they gather in a classroom lab of wood and metal, overhead lights, stools, beakers, tubes, candles (tapers, specifically) scattered about, a hissing gas flame, and whatnot. Faraday: “Humankind?” Tell me about that. DeCoste: Yes. “Fellow-men,” you see, appears to exclude all who are not men—women, children, all sorts of people that we don’t believe you would want to exclude and who we certainly don’t. We wish to include everyone, all humankind, as we hope and believe that was your original intent. Faraday: Ah. So “fellow-men” no longer encompasses all. Hammack: Think of it as a twenty-first century thing. Faraday: Yes. I wonder. In another century or two, will “humankind” prove too narrow? So how does a candle work? And how are candles like us? With all due apology to the true understanders and explainers of chemistry, I will do my best to tell you. 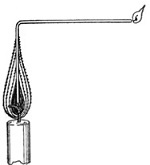 First, candles do not burn in a vacuum. Like us, they rely on a steady supply of oxygen and fuel to keep their flame alive, and it is not redundant to say that a steady, unwavering supply of oxygen and fuel results in a candle’s steady, unwavering flame. Any deprivation of fuel or oxygen will bring about a flickering flame and, eventually, death. But, like us, a candle’s flame can survive many erratic conditions, whether that of being swayed ever so slightly by wayward breezes or that of being emphatically knocked about by gusts of wind. 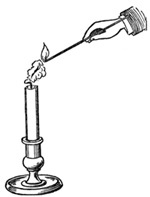 The actions of the flame will portray these conditions, as will the candle’s body. In addition, candles will react to heat, to cold, to humidity, to air pressure—the same basic elements we all respond to. And just as our lives result in waste, so does a candle’s. and the environment in which the candle is lit and burned. Blow out a candle without turning it into a big, dramatic, overblown event. Just blow it out gently, normally, then quickly put a lit match to the stream of vapor that results. If your timing is right, the vapor will ignite, the flame will follow the vapor back to the wick, and the candle will resume burning. If it doesn’t work at first, try, try again. There is not a law under which any part of this universe is governed which does not come into play and is touched upon in these phenomena. There is no better, there is no more open door by which you can enter into the study of natural philosophy than by considering the physical phenomena of a candle.